Fewer Americans than forecast signed contracts to buy previously owned homes in September, the fourth straight month of declines. Mortgage rates last month reached two-year highs. Another report today showed factory production rose less than forecast in September. Fed policy makers meet Tuesday and Wednesday when they will consider when to start trimming $85 billion of bond purchases. Equities: The market tried to make an overnight push above 1760, but could not hold the strength. The DEC13 E-mini S&P 500 (CME:ESZ13) is up 1 point this morning to 1755. Our next levels higher are 1760 and then 1770. We could potentially see these levels this week IF we get a very dovish Fed. HOWEVER, the dovishness is a double-edged sword for the market because, for example, both numbers this morning were weaker than expected. Thus, how can the market continue to march higher and higher if the U.S. economic numbers are not justifying the increasingly rich valuations in the market? Of course the Fed is basically the answer. The Fed’s QE program has been driving this market higher, but we do believe at some point if the market starts to get concerned about a less then healthy housing market or economy, we may see some sharp selling at these levels above 1750. Bonds: The bond market is very quiet on this Monday, waiting for Wednesday’s announcement. We do believe the DEC13 U.S. 30-year bonds (CBOT:ZBZ13) have potential to rally further, possibly touching the 136 level, really dependent upon the Fedspeak regarding the economy and the tapering timeline. We believe the Fed will say the economy and job growth is not where they want it and will not express urgency regarding tapering. The two major economic numbers this morning also came in below expectations, thus also potentially supporting the bond market. Currencies: The DEC13 USD (NYBOT:DXZ13) is up 11 ticks to 79.36, finding some support before Wednesday’s Fed announcement. The next key resistance level above here is 79.75. The DEC13 Euro is down 15 ticks to 137.92, but overall we believe this is simply position lightening before this week’s key announcement. The DEC13 Aussie dollar and the DEC13 Kiwi are both relatively strong today, with the Kiwi actually higher by 11 ticks to 82.65 and the Aussie lower by just 2 ticks to 95.51. If the Kiwi gets lower to the 81′s, we believe it might present oversold conditions. Commodities: Gold is our focus today, with DEC13 gold (COMEX:GCZ13) up $8 to $1,360. We believe this is because of the market trying to price in a potential dovish announcement this Wednesday from the Fed. 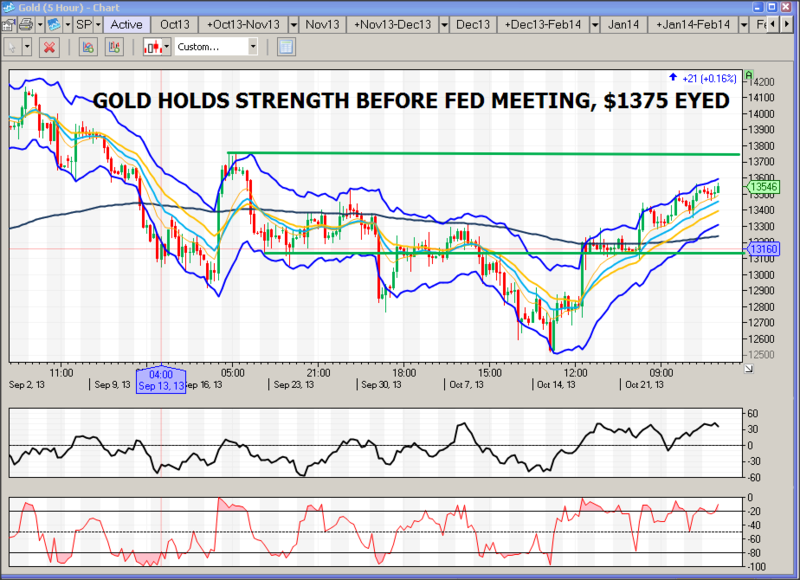 If the Fed dovishness continues, and the market is less and less sure about if and when the Fed will start to taper, we would not be surprised to see gold keep rallying, possibly approaching the $1,400 mark. It really, in our view, all comes down the Fed’s actions regarding QE. DEC13 corn (CBOT:CZ13) continues to show weakness, trading down $.08 today to $4.31, heading closer to our next key target and level of $4.25. DEC13 WTI crude oil (NYMEX:CLZ13) is staging a minor recovery of last week’s losses, trading higher by $.69 to $98.54. We believe the $100 might serve as initial resistance. Anthony Lazzara, CEO of Newport Beach, Calif., commodities investment firm Lido Isle Advisors, spent 10 years as a trader and floor broker at the Chicago Board of Trade and Chicago Mercantile Exchange. Anthony has significant experience in the energy, fixed income, and equity futures markets. After being a long-time independent futures trader, Anthony saw a tremendous opportunity to educate investors on how to invest in professional traders. Anthony is now focused on his duty as CEO of Lido Isle Advisors.